TV Channel Rossiya-1 falsely accused U.S. Ambassador in Ukraine Geoffrey Pyatt of master-minding the recent resignation of a Ukrainian oligarch, Igor Kolomoisky. 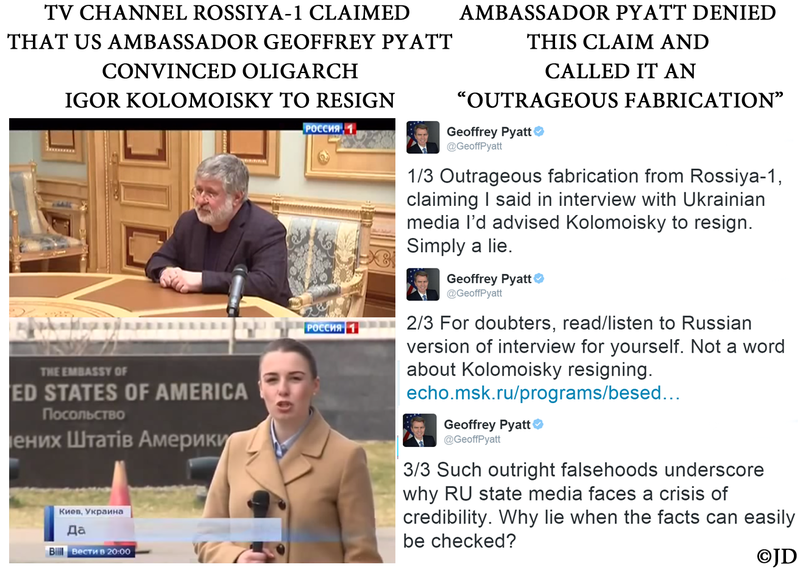 Ambassador Pyatt vehemently denied these allegations and pointed out that the interview mentioned by the Russian media did not contain any mentions of his alleged involvement in Kolomoisky’s resignation. Pravda.ru and other media outlets decried the firing of Tatiana Abramova from her recently-acquired position as a policewoman in Ukraine. 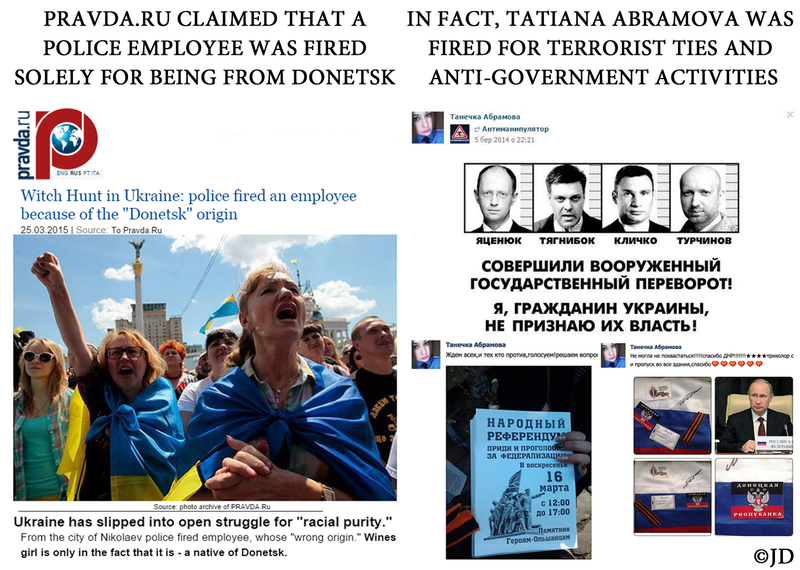 Pravda claimed that the firing was an example of Ukraine’s “struggle for racial purity.” Ren.tv alleged that the only reason for Abramova’s removal from her position is that she was born and raised in Donetsk. In reality, the young woman was removed from her position because of her open affiliation with separatists/terrorists in Ukraine, as well as openly anti-governmental sentiments Abramova posted on social media. 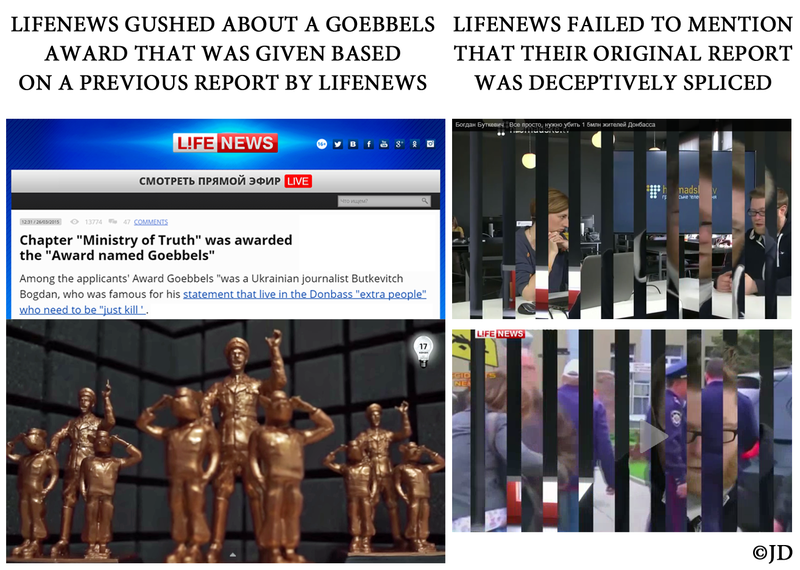 Lifenews gleefully reported that media activists were planning to award a “Goebbels prize” to Ukrainian journalist Bogdan Butkevych. In an ultimate irony, the decision to present this mock award was based on a crudely spliced video created by none other than LifeNews. Statements by Butkevych were purposely spliced together out of context, to make it seem as though he was calling for the genocide of 1.5 million people of Donbass. 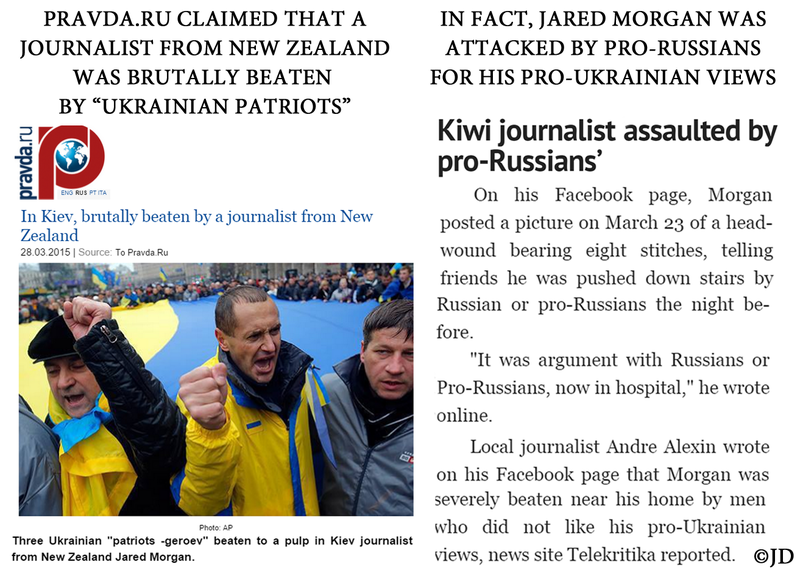 This scenario is a jarring example of the stories artificially slapped together by Russian propaganda that take on a life of their own, even after being repeatedly debunked. 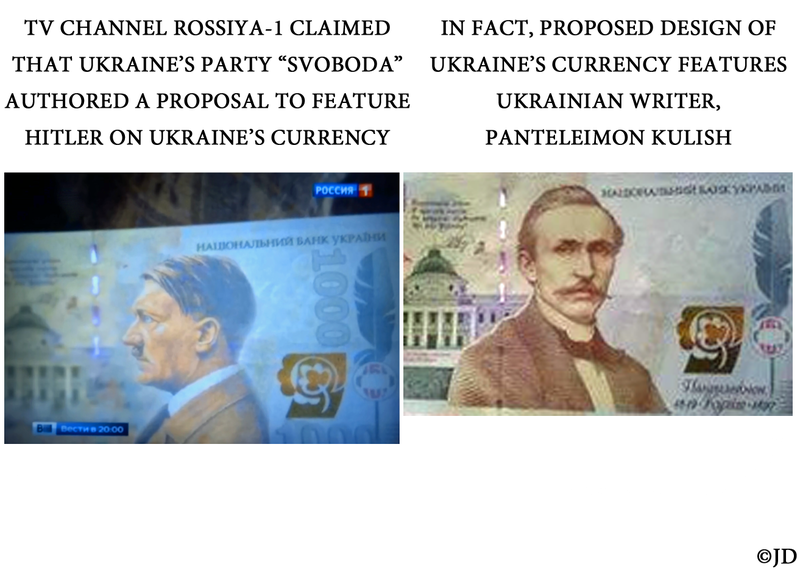 TV Channel Rossiya-1 falsely alleged that Ukrainian lawmakers were proposing to feature Adolf Hitler on the new design of Ukraine’s official currency, hryvnia. 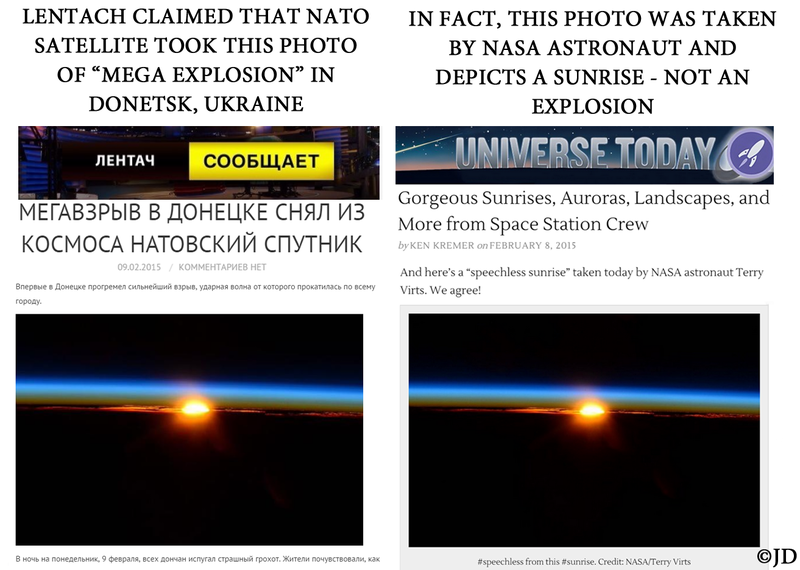 In reality, the image used by Rossiya-1 was a fake. The proposed hryvnia design features Ukrainian writer, Panteleimon Kulish. 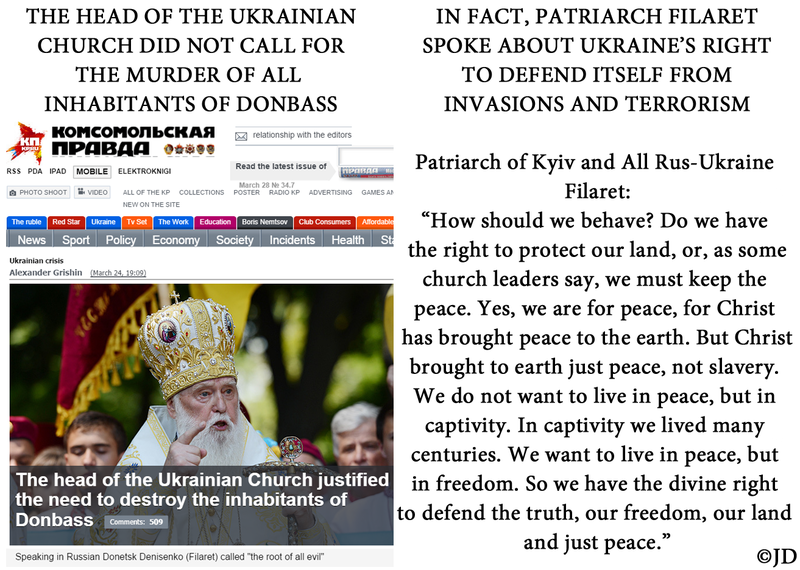 Komsomolskaya Pravda falsely accused the head of Ukrainian church, Patriarch Filaret, of articulating the need for the killing of all Russian speakers in Donbass. In reality, Patriarch Filaret said that it was the divine right of Ukraine and Ukrainians to defend the truth, freedom, their land and peace from terrorists and invaders. 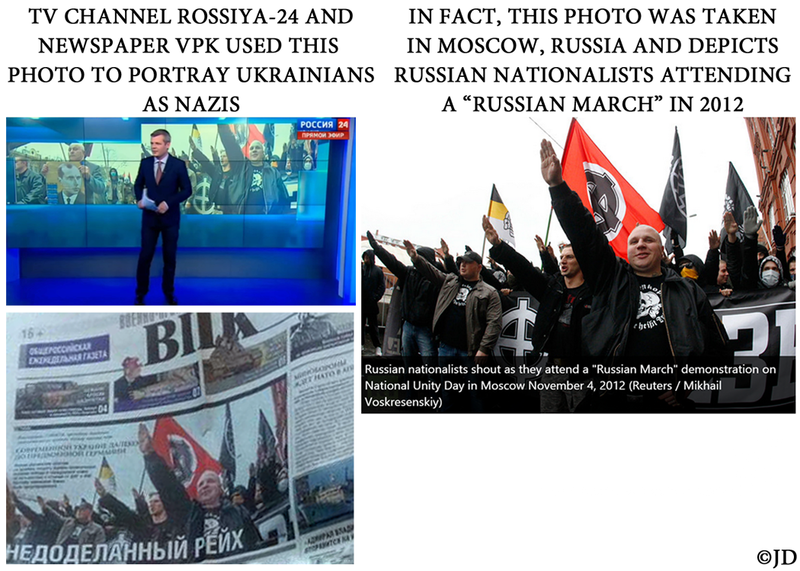 TV channel Rossiya-24 made claims about the alleged rise of Nazism in Ukraine, while using a 2012 photo of Russian nationalists attending a “Russian March” in Moscow. Newspaper VPK used the same image, while bemoaning the alleged rise of the new Reich in Ukraine. Numerous Russian publications, including Obozrevatel and RIA Novosti, accused U.S. Ambassador to the Russian Federation John F. Tefft of stoking tensions by leaving a bouquet of flowers tied with Ukrainian-colored ribbons at the site of Boris Nemtsov’s assassination. 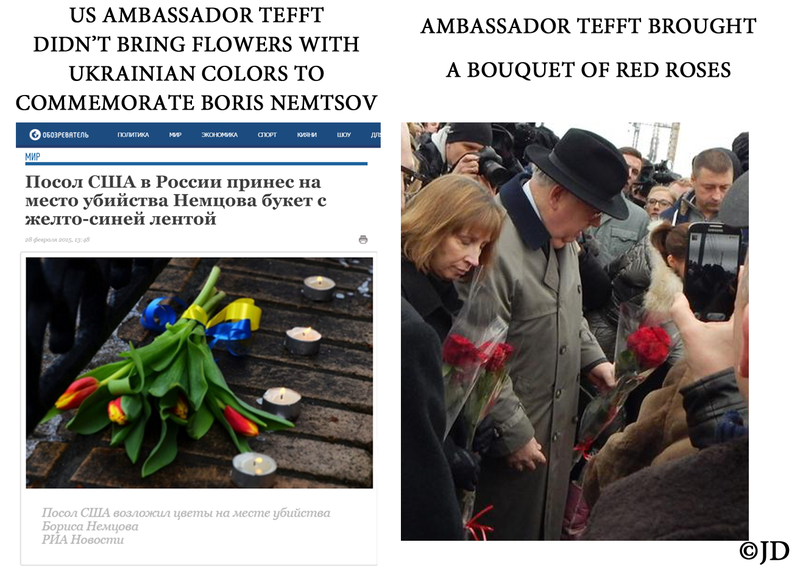 In reality, Ambassador Tefft brought a simple bouquet of red roses and not the flowers shown by Russian publications. With respect to the murder of Boris Nemtsov, Putin’s close friend and ally, the Head of the Chechen Republic Ramzan Kadyrov posted a message on his Instagram page with over 848,000 followers. He falsely attributed the following quote to Edward Snowden: “They started to eliminate those, whom they have fed for many years. They don’t need those who couldn’t accomplish their plans and those who know their secrets. State Department won’t stop with Nemtsov, they will go further.” Kadyrov did not provide the source of this preposterous statement. 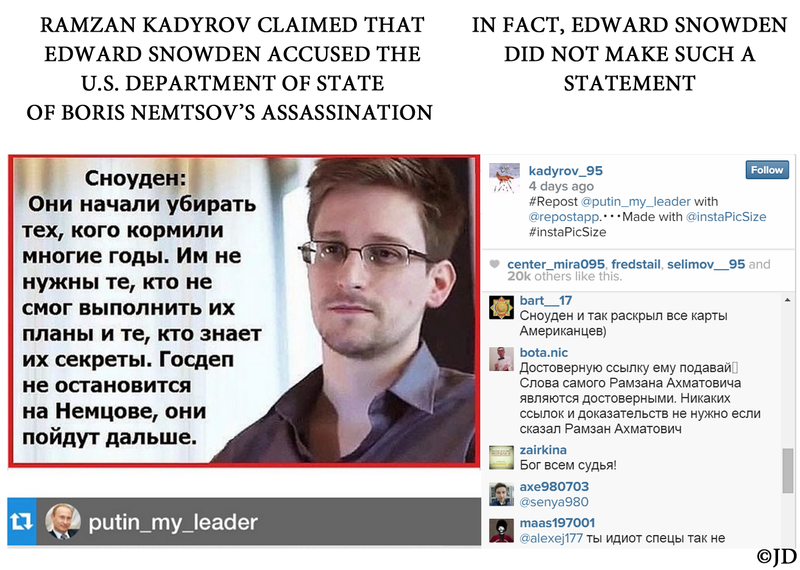 Snowden did not post or otherwise disseminate any such allegations through any of his usual means of public communication. On its face, the quote appears to be completely fabricated. 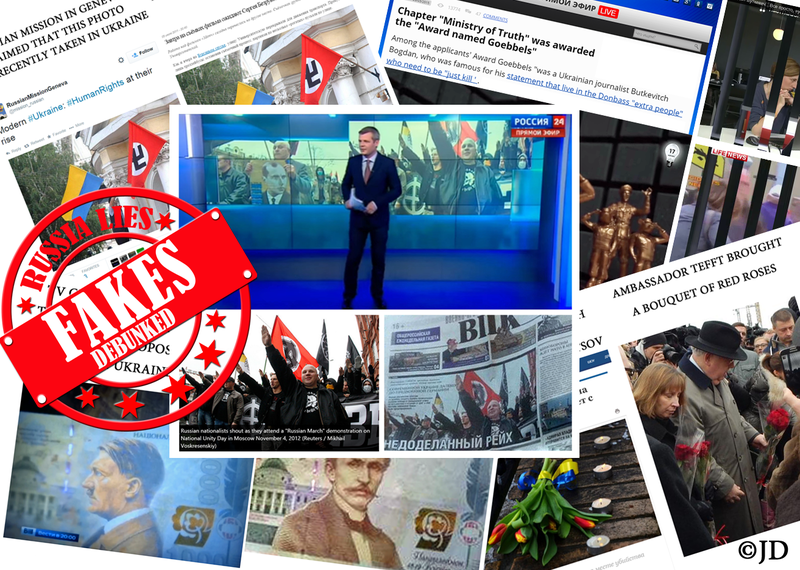 Komsomolskaya Pravda falsely claimed that Ukrainian lawmakers were planning to cancel the celebration of “Victory Day” in Ukraine. 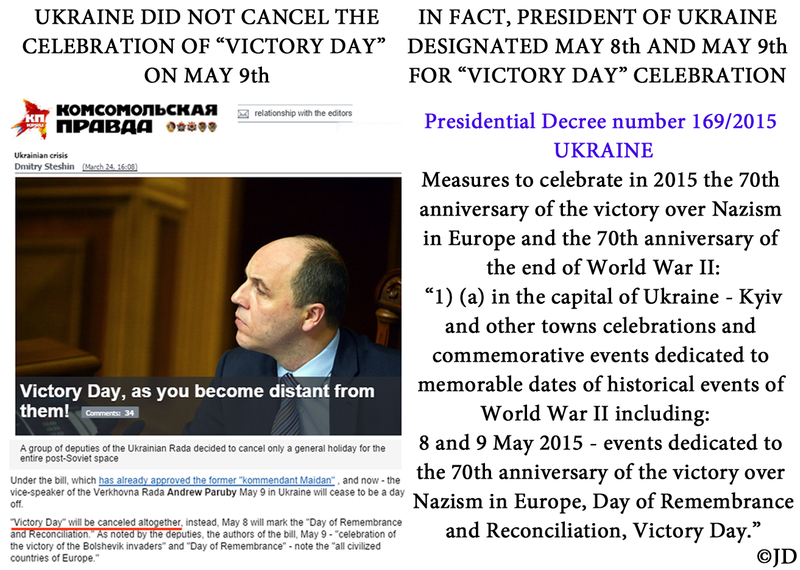 In reality, the Victory Day celebrations weren’t cancelled, but extended to include both May 8th and 9th, according to the decree signed by President Poroshenko. TV channel Zvezda falsely claimed that World War II veterans in Lviv, Ukraine were told not to wear their medals for the Victory Day celebrations. Anna News disseminated similar misrepresentations. 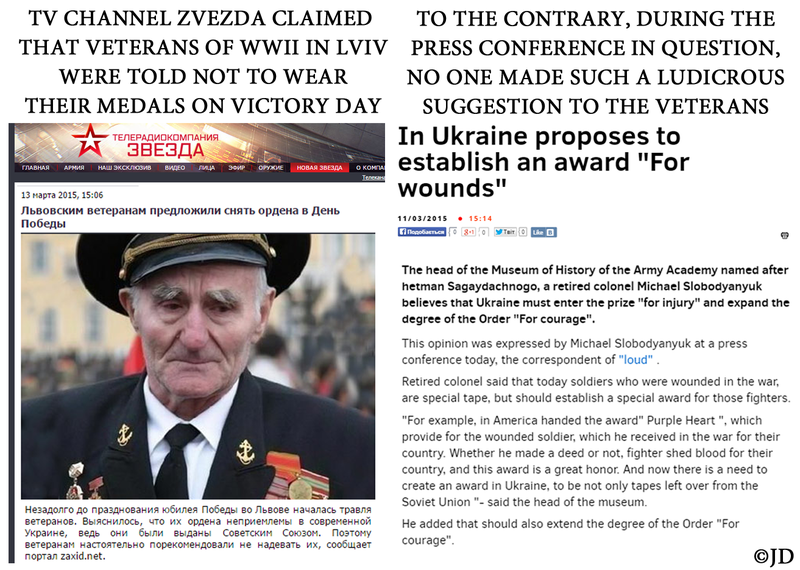 In reality, Ukrainian veterans weren’t told not to wear their medals. To the contrary, Ukrainian authorities are considering the possibility of introducing additional types of military decorations for the members of the Ukrainian armed forces wounded during ongoing hostilities. 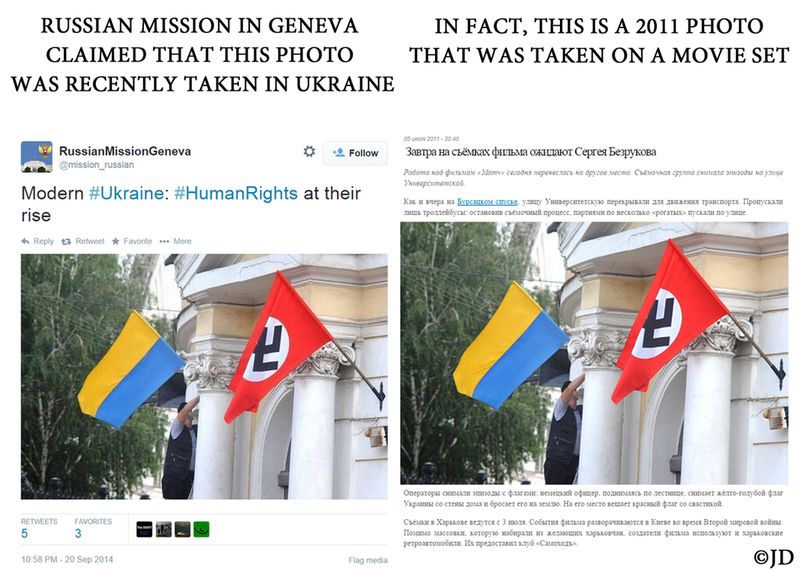 The Russian Mission in Geneva posted an image of the Ukrainian flag side by side with a Nazi flag, sardonically describing the photograph as the symbol for the rise of human rights in Ukraine. In fact, the image in question was taken in 2011 on a movie set. 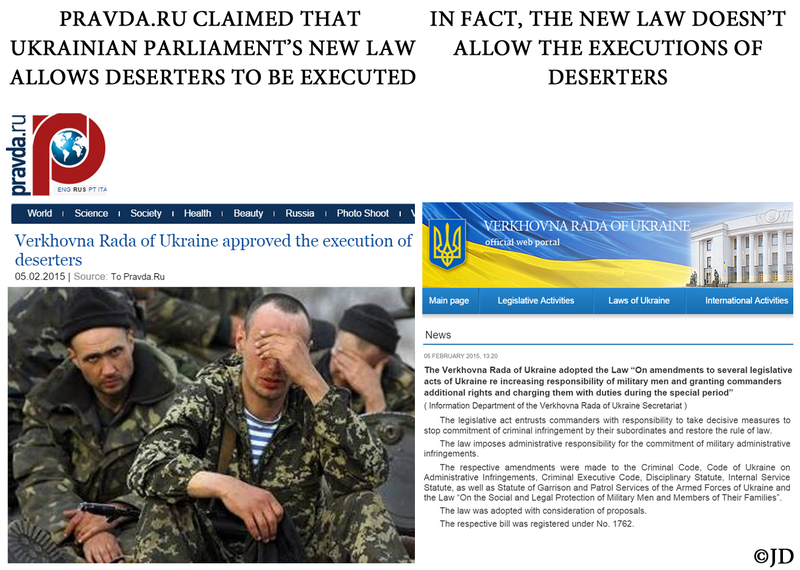 Pravda.ru falsely claimed that a new Ukrainian law allows for a summary execution of deserters. In reality, the law does not contain any provisions that would allow commanders to kill deserters. The new law specifically directs commanders to avoid causing serious bodily harm or death to their subordinates. Russian media, including Lentach and Vzor, claimed that a NATO satellite captured the image of an alleged strike against Donetsk by the Ukrainian military. Some media outlets ventured to say that the Ukrainian armed forces might have used nuclear weapons in eastern Ukraine. In reality, the image they used was taken by a NASA astronaut. It depicts a sunrise and not an explosion of any kind. Russia’s Security Council claimed that the National Security Strategy of the United States contains a number of threats to the Russian Federation. Komsomolskaya Pravda reported that amongst these alleged threats, the U.S. was planning “to perfect the strategy of color revolutions” that would likely be used against Russia. 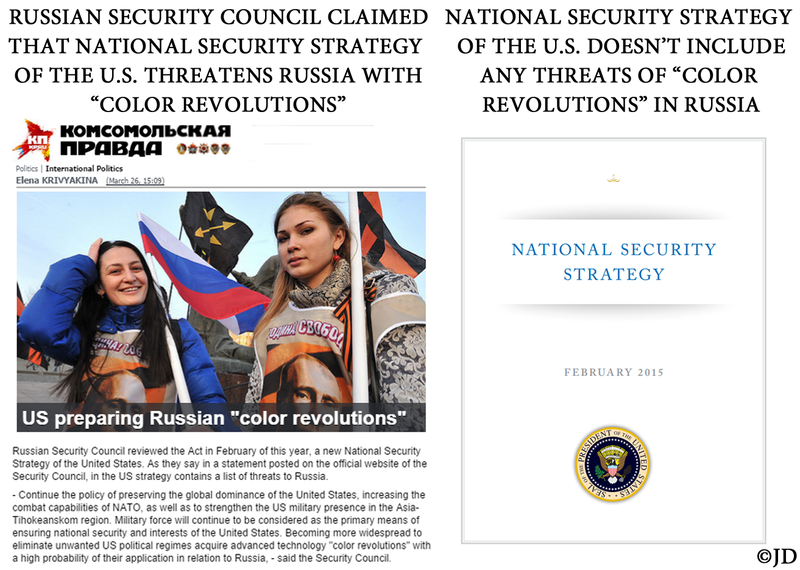 In reality, National Security Strategy of the United States does not contain any mention of fomenting “color revolutions” in Russia or anywhere else in the world. 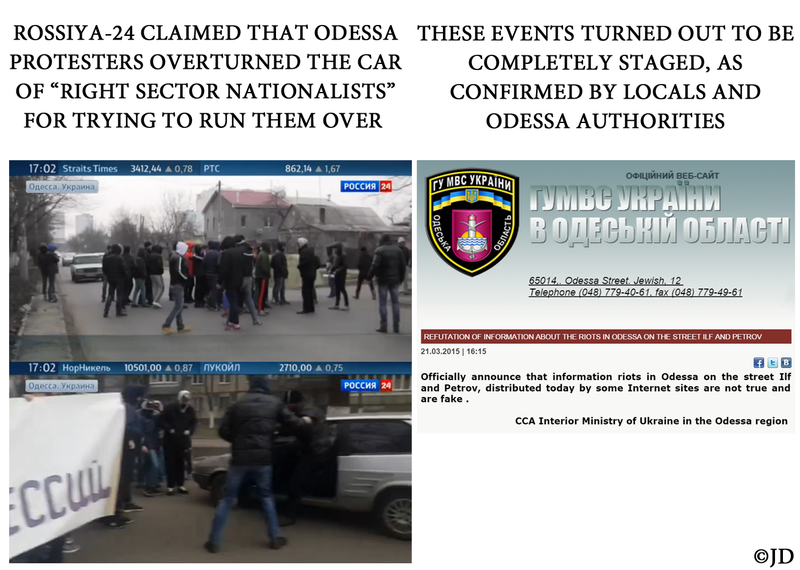 Russian News Agency TASS baselessly claimed that Carpathian Rusyns in Ukraine held a rally and made demands for autonomy. TASS quoted Pyotr Getsko, an alleged leader of the Carpathian Rusyns organization. The real head of the organization, Evhen Zhupan, pointed out that Getsko is a wanted person in Ukraine, who was absent from the region for the last three to five years. 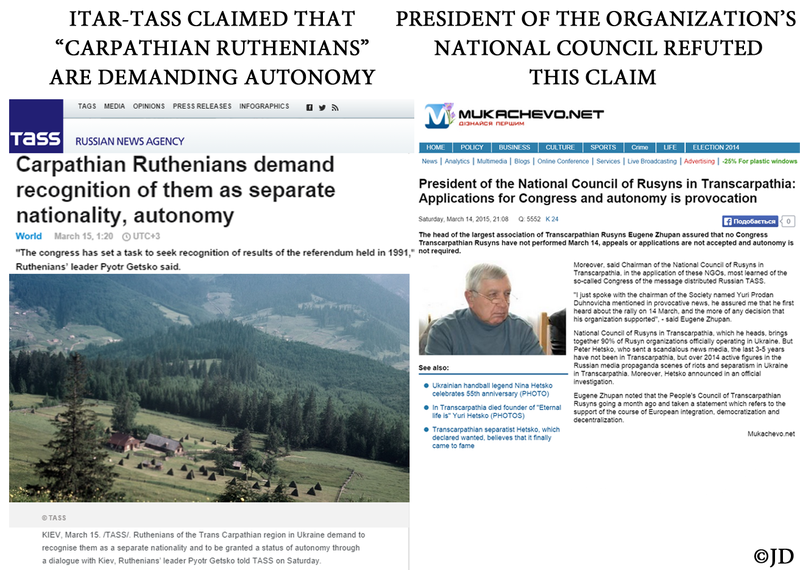 Furthermore, the organization of Carpathian Rusyns in Ukraine didn’t hold such a meeting, as alleged by TASS, and didn’t make demands for autonomy. One month earlier, Carpathian Rusyns agreed on a resolution for Euro-integration, democratization and decentralization. 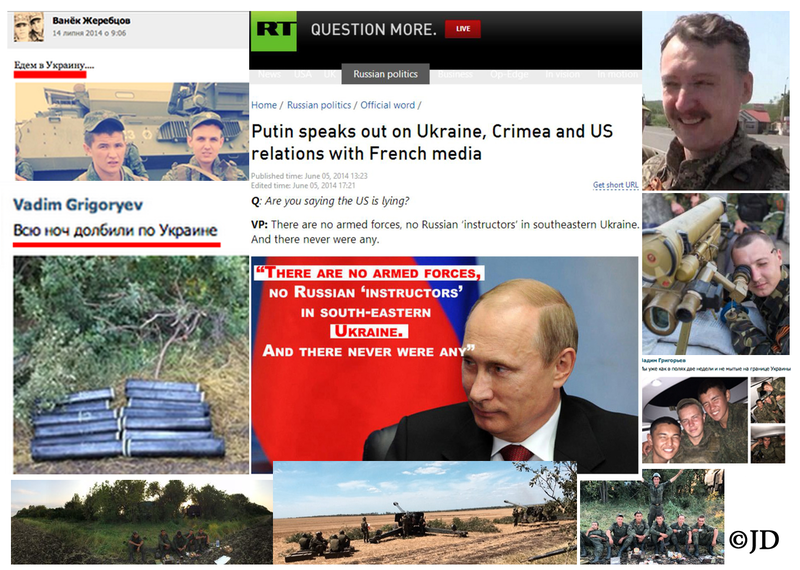 The Kremlin continues to deny the presence and involvement of Russian troops in Ukraine. 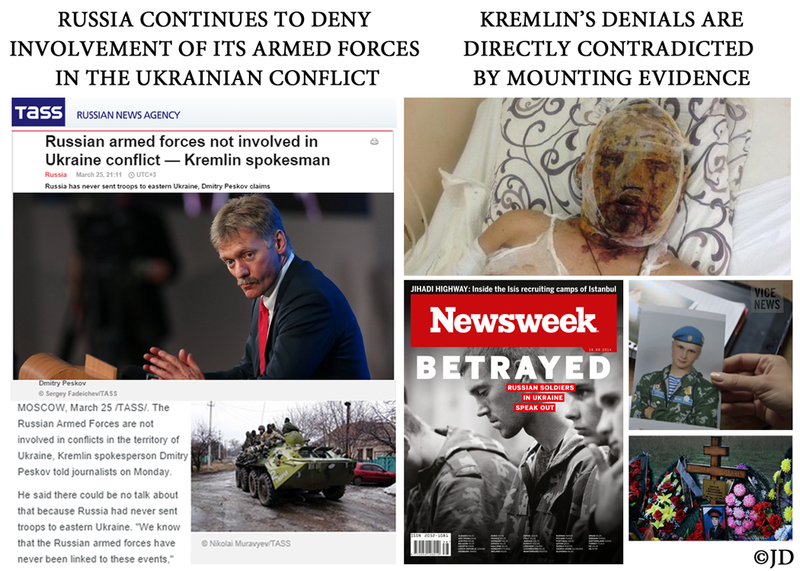 It should be noted that Putin recently debunked his own similar denials, pertaining to the part Russian troops played in the annexation of Crimea. Russian News Agency TASS reported that, according to Vladimir Putin, phantom “organizers of the coup” in Ukraine were “planning an assassination of former President Viktor Yanukovych. 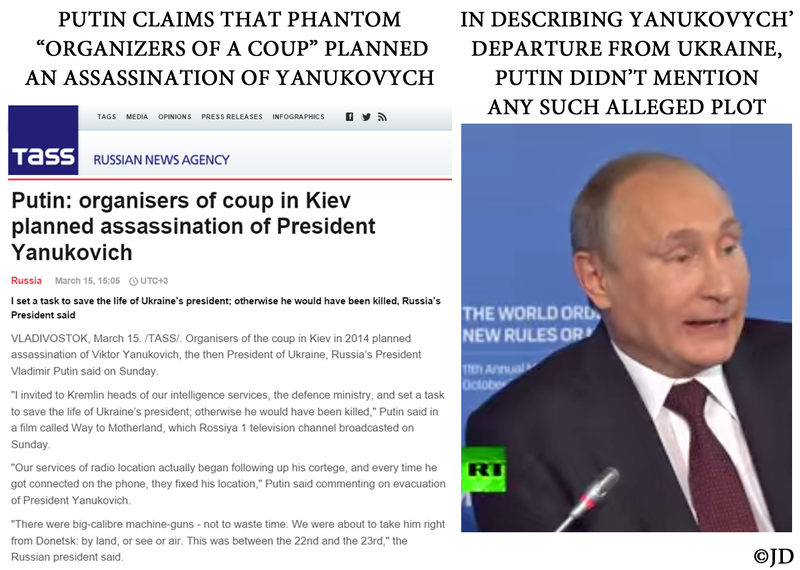 Contrary to these claims, Putin’s own comments reveal that it was he who convinced Yanukovych that he was in imminent danger, convincing the former President to run to Russia, after he abandoned his official post. Ukrainian authorities sought Yanukovych to arrest him. There is no evidence of any type of “murder plot” against the former President of Ukraine. 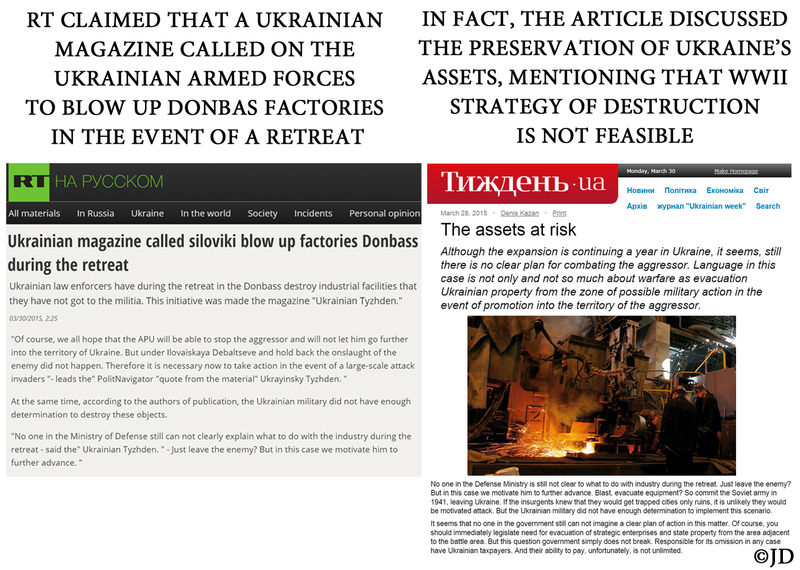 RT alleged that a Ukrainian magazine called upon the armed forces of the country to “blow up the factories in Donbass during retreat.” In reality, magazine Tyzhden discussed the difficult task of preserving Ukraine’s assets during ongoing hostilities. It mentioned the practice of removing the equipment and destroying the buildings as a strategy used by the Soviet Army during World War II, while also pointing out that such a scenario was not feasible in this day and age.